This Sunday, April 21st, we’ll finally see if Philip Gilbert has been bluffing all Classics season long! La Doyenne is the oldest Classics race on the calendar and is French-speaking Belgium’s answer to Dutch-speaking Belgium’s Tour of Flanders. We are now in the Ardennes; a very hilly, forested area where a different sort of rider comes to the front. This race is usually one for the ‘puncheur’ – guys like Gilbert, who don’t win 3-week tours, but can power up a steep 2-km climb like nobody’s business. My pick this year is Vincenzo Nibali, but I’ll take that back if Phil decides it’s time to win something this year. 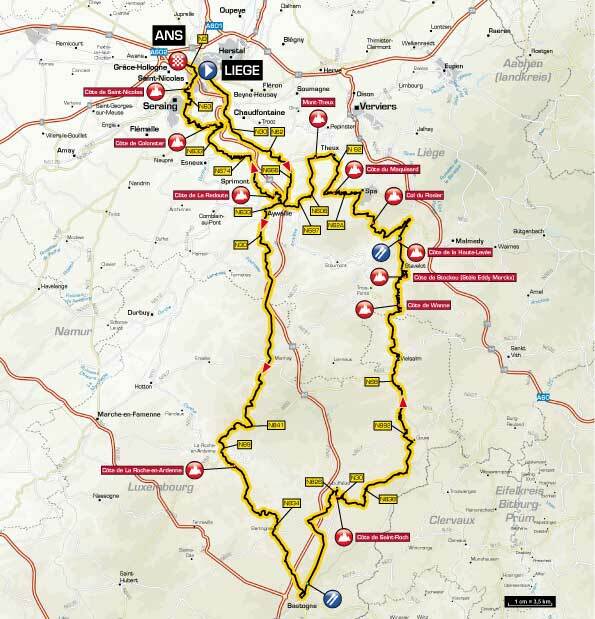 This entry was posted in Cycling and tagged liege bastogne liege 2013. Bookmark the permalink. I was going to pick Hesjedal, but I thought that would be too obvious. Dan’s a likely candidate this spring. As long as it’s a great finish like last year, I don’t care who it is! But Casar would be really nice to see, agreed.